The New York Times revisits it's Imagining 2076 interactive project, which was published in tandem with an essay by Calit2 Director Larry Smarr. The I Programmer team summarizes several essays about technology from the New York Times, including Larry Smarr's "An Evolution Toward a Programmable Universe." Fox5 reporter Perette Godwin produces a segment on Calit2's hunt for a lost painting by Leonardo da Vinci, including an interview with UCSD Professor of Visualization Falko Kuester. Zoë Corbyn discusses the new director of the MIT Media Lab through a comparison to Calit2 , featuring quotes from Larry Smarr. In a report on the DARPA Shredder Challenge, reporter Mark Oestreich notes the sabotage that the UCSD team faced with their crowd-sourcing approach to solving the puzzle. Elisabetta Povoleto discusses Maurizio Seracini's work with Da Vinci paintings and National Geographic's response to the methods used. Calit2 Director Larry Smarr contributes an essay to the Times' special report on "The Future of Computing." Interdigital and Calit2 will collaborate on an Innovation Challenge, which will award $175,000 in prizes for innovations in wireless technology. Tiffany Trader writes about Larry Smarr and his theories on the increasing programmability of a worldwide network of low-power processors. Tiffany Trader analyzes Larry Smarr's essay on networked computing in the New York Times. A link and short description of Larry Smarr's article in the New York Times. An essay by Larry Smarr about the future of data transmittal and how new technology could drastically affect our way of living. Calit2's collaboration with InterDigital, which includes a contest that will award $175K in cash prizes for wireless innovations, is featured on the Yahoo! Finance page. The Dallas Morning News picks up our story on a new competition sponsored by Calit2 and Interdigital that will award $175K for new wireless innovations. The blog about communications and collaboration technologies notes a new partnership between Calit2 and Interdigital: The Innovation Challenge. Amarnath Gupta, a researcher with the San Diego Supercomputer Center (SDSC) at the University of California, San Diego, has been named a Distinguished Scientist by the Association for Computing Machinery (ACM), the world's largest educational and scientific computing society. The San Diego Beacon Community (SDBC), announced today that it has selected Santech to deploy its SanText(TM) SMS platform to improve immunization rates through text message communication. Calit2's Kevin Patrick is a founder of Santech. An article by Bruce Bigelow about Larry Smarr's essay on "Quantified Health." An article about the engineering contest sponsored by Calit2 and Interdigital. It promotes advanced wireless R&D at top universities and awards $175,000 in cash prizes. An article detailing Santech's collaboration with HealthyRoads' sms service. Co-founder of Santech Kevin Patrick is also the Calit2 Director of the Center for Wireless Population Health Systems. TMC News talks about Amarnath Gupta's achievements at the San Diego Supercomputer Center. Santech, a company co-founded by Calit2's Kevin Patrick, is attempting to improve immunization rates through SMS messaging. San Diego, as one of 17 "beacon communities," is one of the first cities to try this technology. The UC website reports on SDSC's Amarnath Gupta and his work with the Neuroscience Information Framework (NIF) project at Calit2. Leila Meyer discusses InterDigital and Calit2's I2C Innovation Challenge, set for early 2012. Bruce V. Bigelow mentions Larry Smarr's article, "Quantified Health: Toward Digitally Enabled Genomic Medicine," along with other life sciences news. An article about the work of ACM Distinguished Scientist Amarnath Gupta, a researcher with the San Diego Supercomputer Center (SDSC). BioPortfolio reposts an article by Xconomy about Larry Smarr's article on quantified health. Reuters reports on a collaboration between Calit2 and InterDigital that includes a $175,000 Innovation Challenge. Insurance News talks about HealthyRoads' announcement that they will work with Santech, co-founded by Kevin Patrick to develop an SMS service to offer users health tips and reminders. An article talking about how Santech has been chosen by HealthyRoads to help develop a health-based SMS service. Santech was co-founded by Kevin Patrick. The CCC blog picks up Xconomy's profile of Calit2 Director Larry Smarr and his decade-long quest to improve his health by monitoring more than 60 biochemical markers. Xconomy.com reporter Bruce Bigelow interviews Calit2 Director Larry Smarr about his 10-year quest to improve his health by monitoring more than 60 biochemical markers. Blogger Jon Baer reports on Calit2-affiliated researcher Manuel Cebrian's attempt to solve the DARPA Shredder Challenge. An article about Calit2's attempt to win the DARPA "shredder challenge" by enlisting thousands of volunteers on the internet. Calit2-affiliated researcher Ernesto Ramirez is featured in an article by CityBeat reporter Kinsee Morlan on San Diego's Quantified Self movement. 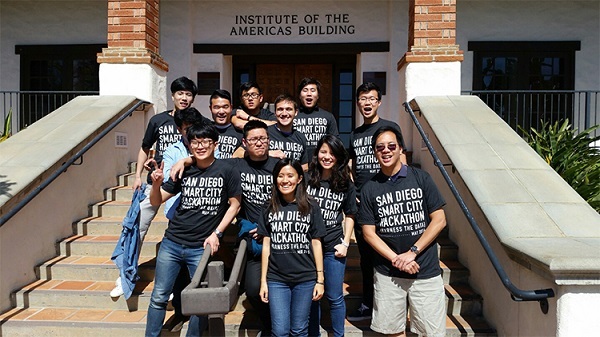 An article about UCSD students in the PRIME program who built a digital interfaces and displays under Calit2 staff for use in the Knowledge Capital Trial Event in Osaka, Japan. FOH Online reports on the AES Audio Networking Conference, which took place at Calit2. A description of the Grace Hopper Women in Computing Career fair, at which Calit2 was a gold sponsor. An article about the Grace Hopper Celebration of Women in Computing career fair, which had a record turnout and featured Calit2 as a major sponsor. Chris Palmer reports on a Calit2-designed touch screen interface for a table that allows exhibit visitors to manipulate digital copies of photographs at the San Diego Museum of Photographic Arts. Are we ready for driverless cars? Charlie Gillis reports that car companies are increasingly taking safety out of driver hands and letting computers do the work. Article quotes UCSD professor Mohan Trivedi from the Laboratory for Intelligent and Safe Automobiles, a Calit2 partner. An article about UCSD's 50th anniversary and the much-needed funds raised by that milestone. UCSD was also named first in the nation for “what colleges are doing for the country” and hosted the Clinton Global Initiative University. Wired Science Blog writer David Dobbs cites a report by Calit2 Communications Intern Chris Palmer in his column about a talk he gave at ScienceWriters 2011. Researchers at the San Diego Supercomputer Center (SDSC) and the California Institute for Telecommunications and Information Technology (Calit2)have been awarded a $1.4 million grant from the National Science Foundation (NSF. Researchers will develop new tools to help manage ever-growing data sets used in next-generation DNA sequencing. The Davenport, Iowa-based news channel reports on The Atlantic Meets the Pacific forum, which featured several Calit2-affiliated speakers. PhysOrg reports on a behavioral research study underway in UC San Diego’s Laboratory for Intelligent and Safe Automobiles (LISA), which is led by Calit2's Mohan Trivedi. Scientific Computing reports on Moneta, a first-of-its kind, phase-change memory solid state storage device that provides performance thousands of times faster than a conventional hard drive and up to seven times faster than current state-of-the-art solid-state drives. Moneta was developed, in part, by Rajesh Gupta of Calit2. The 'hyper-local' La Jolla Patch advances a Calit2-sponsored event that will bring two accomplished UCSD explorers to UCSD. Columnists Neil Senturia and Barbara Bly make the case that UCSD's Eitaan Yaakobi and other Young Marconi Scholars are 'the new nerds': Outgoing, charming, attractive, articulate, and athletic with diverse social interests and hobbies. Yaakobi is a researcher with the Calit2-affiliated Center for Magnetic Recording Research. Dian Schaffhauser of Campus Technology reports on Calit2's new Vroom, a virtual room made entirely of NEC displays. The La Jolla Light advances The Atlantic Meets the Pacific forum, which will be held at premiere venues around UCSD, including Calit2. Space Daily, which bills itself as "your portal to space," reports on a recent discovery of a supernova that was enabled by the Calit2-affiliated HPWREN project. Science writer Lynne Friedmann reports on the Marconi Society Symposium and its featured topic: "How Will the Internet Survive?" The Calit2-affiliated HPWREN project is mentioned in this article about a recent supernova discovery. The La Jolla Light advances "The Atlantic Meets the Pacific" forum, which will take place in October at several premiere UCSD venues, including Calit2. NBC San Diego reporter Lauren Steussy reports on a partnership between the Palomar Observatory and UCSD's HPWREN project, which is affiliated with Calit2, to locate a supernova just as it was exploding. Zimbio writer posts an article about a recent discovery of a supernova within hours of its explosion, which was made possible, in part, by the Calit2-affiliated HPRWREN project. HPCWire, which covers "the fatest computers in the world and the people who run them," reports on the Calit2-affiliated HPRWREN's involvement in the recent discovery of a supernova within hours of its explosion. San Diego Union-Tribune reporter Pat Flynn reports on the Marconi Symposium held at the UCSD division of Calit2, which addressed the question "How Will the Internet Survive?" The Taipei Times runs a story that originally appeared in the New York Times about Calit2's Maurizio Seracini, who may be soon ending his 30-year quest to find a lost masterpiece by Leonardo da Vinci. The Indiana Gazette picks up on a story about Calit2 researcher Maurizio Seracini and his decades-long quest to find a lost masterpiece by Leonardo da Vinci. "The South African Art Times"
In a piece that originally appeared in the New York Times, reporter Rachel Donadio tells the tale of Calit2 researcher Maurizio Seracini and his quest to find a lost painting by Leonardo da Vinci. KPBS reporter Neiko Will explains research being conducted by Calit2-affiliated electrical engineering Professor Gert Lanckriet, who is teaching computers to automatically play music based on the user's location and activity. A new forum co-organized by UCSD and the Atlantic Magazine (and held, in part, at Calit2) is the focus of San Diego Union-Tribune science writer Gary Robbins piece. "The Atlantic Meets the Pacific" Forum will feature Twitter co-founder Evan Williams, self-help guru Deepak Chopra and other notable speakers. The Mission Times Courier calls the "Atlantic Meets the Pacific" forum, which is co-sponsored by The Atlantic magazine and UCSD (and held, in part, at Calit2) one of the 'most coveted symposiums." Calit2-affiliated researcher Jan Kleissl calls young Aidan Dwyer's solar array impressive, but points out a flaw in its design. New York Times reporter Rachel Donadio describes Calit2 researcher Maurizio Seracini's decades-long quest to find a lost masterpiece by Leonardo da Vinci. News Blaze reports on a new collaboration between Pfizer and UCSD Health Sciences to speed up the process of drug discovery. Several of the researchers involved are affiliated with Calit2. Union-Tribune Science reporter Gary Robbins writes about Calit2 researcher Ayse Saygin's study of the human brain and its reaction to the 'uncanny valley' phenomenon. North County Times reporter Bradley J. Fikes covers a new development from several photonics researchers, including Calit2's Shaya Fainman, who have discovered a way to improve light-based "photonic" microprocessors so they can handle information far more efficiently than electronic chips. The blog, which covers research related to archaeological excavation, reports on a new device, fashioned from the Kinect gaming system, which will allow Calit2 researchers to scan archaeological dig sites in 3D. Discovery magazine blogger Joseph Castro compares Calit2 researchers to Indiana Jones in a story about a new Kinect hack for scanning archaeological dig sites. China's XinhuaNet reports on a new device, fashioned from a hacked version of Microsoft's Kinect, that will help archaeologists make 3D scans of dig sites. Hong Kong news source Sina.com reports on a new device created by Calit2 researchers that transforms a Kinect gaming system into a 3D scanner for archaeological dig sites. Gizmodo picks up our story about research being conducted at Calit2 to turn a Kinect gaming device into a high-tech 3D scanning tool for archaeological dig sites. Ubergizmo's Tyler Lee reports on Calit2 researchers Jurgen Schulze and Daniel Tenedorio, who have modified a Kinect gaming system to take 3D scans of people, objects and even archaeological dig sites. MSNBC.com calls a new Kinect hack by Calit2 researchers a "triumph." The handheld 3-D scanner is capable of virtually replicating people, objects and even archaeological dig sites. The History Blog calls the collaborative potential of a new Kinect hack by Calit2 researchers Jurgen Schulze and Daniel Tenedorio "mind-boggling" and says that the Calit2 StarCAVE "looks like something Angela should be using on (the forensic crime investigation TV show) 'Bones.'" Fangaroo popular science reporter Rebecca Boyle reports on the Arkinect, a hacked Kinect game system that can create 3D scans of people, objects and even archaeological dig sites. The Argentina-based technology blog Geekzone reports on a new Calit2 hack that transforms a Kinect gaming device into a 3D scanning tool for archaeologists. The Australian version of the Gizmodo tech blog picks up our story about research duo at Calit2 who have hacked into a Kinect gaming device to fashion it into a high-tech tool for archaeological digs. The Dutch technology blog Elektor reports on a new device developed by Calit2 researchers that transforms a Kinect gaming system into a high-tech tool for archaeological digs. The tech blog with a cult-following calls the Calit2-developed Kinect hack "the latest must-have piece of technology in the archaeological world." A blog affiliated with the famed visionary Ray Kurzweil reports on a new device developed by Calit2 researchers that transforms a Kinect gaming system into a 3D scanner for archaeological digs. Fast Company reporter Kit Eaton calls Calit2's plan to use a hacked Kinect gaming device to take 3D scans of archaeological dig sites 'decidedly futuristic" and "the most cultural use" of the game machine yet. Bio-IT world, which reports on "indispensable technologies driving discovery, development and clinical trials,' quotes Calit2 Director Larry Smarr in a story on the San Diego Supercomputer Center's new Gordon supercomputer. The Next Big Future blog picks up our story on the Arkinect, a a modified version of the Kinect gaming device that can take high-quality, low-cost 3D scans of archaeological dig sites. PhysOrg picks up our story on Calit2 researchers Jurgen Schulze and Daniel Tenedorio, who have modified a Kinect gaming system to take 3D scans of people, objects and even archaeological dig sites. 3D Roundabout, the online trade magazine for stereoscopic 3D content creation, delivery and display, reports on Calit2 Director of Visualization Tom DeFanti's excursion to Luxor to capture 3D CAVEcam imagery. Wired UK blogger Mark Brown reports on Calit2-affiliated researcher Ayse Saygin's work to pinpoint exactly what goes on inside the brain during the 'uncanny valley' phenomenon. eBioNews, a bio-info resource system, runs Inga Kiderra's piece on the work of Calit2-affiliated professor Ayse Saygin's research into what goes on in the brain when a human is subjected to the 'uncanny valley' phenomenon. Today.az, which "covers Azerbaijan inside and outside," runs UCSD writer Inga Kiderra's story on research by Calit2-affiliated researcher Ayse Saygin, who is examining the neurological response to the 'uncanny valley' phenomenon. Reader writer Dave Rice reports on a group of schoolgirls who have created animatronic hats for Opening Day at the Del Mar races as part of Calit2-led engineering workshop. For its Industry news section, Product Design & Development reports on research by Calit2-affiliated researcher Ayse Saygin, who is examining what happens inside the human brain during the 'uncanny valley' phenomenon. ScienceDaily, an online source for research news, covers Calit2-affiliated scientist Ayse Saygin's research into the neurological underpinnings of the 'uncanny valley' phenomenon. TMC.net picks up our story on new software designed by Calit2 researchers that monitors human neurological and physiological responses to architecture. MediLexicon picks up our story on Calit2-affiliated researcher Ayse Saygin's efforts to study what goes on inside the human brain as it experiences the 'uncanny valley' phenomenon. New Blaze reprints are story on Calit2-affiliated researcher Ayse Saygin's study on what goes on inside the human brain during the 'uncanny valley' phenomenon. medGadget reporter Gene Ostrovsky picks up our story on Calit2-developed CAVE-CAD software, which makes architectural design more efficient by allowing users in 3D immersive environments to immediately make and respond to design modifications. Innovations Report, "a forum for science, industry and business," alerts readers to a new breakthrough by Calit2-affiliated nanoengineer Joseph Wang, who has developed a method for making materials and circuits so flexible they can be pushed, pulled and contorted -- even underwater -- and still function properly. Physorg.com, a clearinghouse for news on science, physics, technology and nanoscience, reports on a new development from the lab of Calit2-affiliated Professor Joseph Wang, who has developed a method for making materials and circuits super-flexible. Our story about Tom DeFanti's proof-of-concept excursion to capture 3D CAVEcam footage of Luxor turns up in Archaeology Daily News. The Art of Counting, a blog about the "discovery of patterns, trends and messages in art throughout history," excerpts our story about Calit2 Director of Visualization Tom DeFanti's excursion to Luxor to capture 3D CAVEcam imagery. Newswise carries our story on Calit2-affiliated UCSD Nanoengineering Professor Joseph Wang, who is proving that he can make materials and circuits so flexible that they can be pulled, pushed and contorted – even under water – and still keep functioning properly. Our story about Calit2-affiliated professor Joseph Wang's breakthrough in nanotechnology turns up on News Blaze. Samara Steele reports on the Transborder Immigrant Tool developed by the Calit2-affliated b.a.n.g. lab. eBioNews reports on Calit2 Visualization Director Tom DeFanti's excursion to Luxor, Egypt, where he captured 3D CAVEcam images of the ancient world heritage site. Discovery's team coverage site -- which farms content to treehugger.com, Discovery News and Planet Green -- picks up our piece on Calit2 researcher Tom DeFanti and his proof-of-concept excursion to Luxor. The San Diego news aggregator picks up our story on Calit2 researcher Tom DeFanti's mission to capture 3D imagery of the temples at Luxor, Egypt. The University of Muhammadaiyah Malang online press republishes our story on Calit2 research scientist Tom DeFanti's quest to capture 3D CAVEcam imagery of Luxor, Egypt. The Light publishes Calit2 intern Chris Palmer's story about UCSD undergrad Alan Turchik's collaboration with National Geographic. myScience, which bills itself as "the portal for research and innovation," runs Calit2's report on Tom DeFanti's challenging mission to capture 3D imagery of the temples at Luxor, Egypt. The archaeology blog e-runs our piece about Calit2 Director of Visualization Tom DeFanti's proof-of-concept excursion to capture 3D imagery of the temples at Luxor. Web Newswire reports our piece on a one-year grant from the National Science Foundation, which will allow Calit2 researchers to develop a technical framework and computer models that will simulate the conditions that can spark a wildfire in San Diego’s ‘backcountry’. A new e-beam lithography tool, funded in part by Calit2, will perform basic and applied research fabrication, starting with nano-photonics for intra-chip communication, tissue engineering, and nano-magnetic data storage. The Nano3 cleanroom facility at Calit2 will soon be equipped with an e-beam lithography tool for nano- and microfabrication. A new e-beam lithography tool that will perform basic and applied research fabrication will be installed at the Nano3 facility at Calit2. A new high-performance e-beam lithography tool will be installed at Calit2's Nano3 nanotechnology and microfabrication facility. Fox reports on new research conducted in part by Calit2-affiliated researcher Sungho Jin, which has demonstrated that it is possible to generate odors using a device that attaches to a television. News Blaze runs our story on a National Science Foundation-funded project at Calit2 that will use a technical framework and computer models to help prevent wildfires. Calit2-affiliated researcher Sungho Jin and his colleagues have demonstrated that it's possible to equip televisions with a device that can generate aromas. Thrupoint, which offers technology and consulting services, picks up our story on a new e-beam lithography tool recently purchased by Calit2's Nano3 facility. Azonano.com, "the A to Z of nanotechnology," reports on a new Vistec e-beam lithography tool that will soon be installed in Calit2's Nano3 facility. Nanowerk reports on the Calit2 Nano3 facility's purchase of a Vistec e-beam lithography tool, which will enable basic and applied research for hundreds of academic and industrial users. Research conducted in part by Calit2-affiliated engineer Sungho Jin shows that it's possible to generate odor in a compact device that can fit on the back of a TV. Storage Newsletter, a clearinghouse for news on the worldwide data storage industry, picks up our story on the Center for Magnetic Recording Research, which is home to several Calit2-affiliated faculty. Hugh's News, a blog providing 'news, technology, analysis and insight,' reports on the new, super-fast Moneta solid-state storage device developed by a group of researchers at UCSD, including Calit2 Associate Director Rajesh Gupta. PhysOrg.com, one of the leading web-based science, technology and research news services, picks up our report on the UCSD Center for Magnetic Recording Research. Reporter Catherine Hockmuth covers news out of UCSD that researchers have developed a super-fast phase-change memory solid-state storage device. Bob Brown reports on a phase-change memory solid state storage device developed by Calit2 Associate Director Rajesh Gupta and his colleagues. The device provides performance thousands of times faster than a conventional hard drive and up to seven times faster than current state-of-the-art solid-state drives. "10 News San Diego "
10 News anchor Bill Griffith reports on the new Moneta solid-state storage device developed by a group of researchers at UCSD, including Calit2 Associate Director Rajesh Gupta. San Diego Union-Tribune reporter Sandra Dibble covers the Political Equator event, which was organized in part by Calit2-affiliated professor Teddy Cruz of the Center for Urban Ecologies. The clearinghouse for research news reports on a super-fast phase change memory-based storage system developed, in part, by researchers from Calit2. A team co-led by Calit2 Associate Director Rajesh Gupta has developed a first-of-its-kind phase change memory solid state storage device called Moneta. red Orbit reports on the new Moneta solid-state storage device developed by a group of researchers at UCSD, including Calit2 Associate Director Rajesh Gupta. KPBS' Angela Carone and Maureen Cavanaugh spotlight the Political Equator 3 conference, which was co-organized by Calit2-affiliated professor and architect Teddy Cruz. Nanowerk reports on Moneta, a phase-change memory solid state device developed by a team co-led by Calit2 Associate Director Rajesh Gupta. Video post of a speech by Calit2 Director Larry Smarr at a Future in Review (FiRe) conference. An article in the Business Times highlights the Art of Science Learning Conference, which will take place at the UCSD division of Calit2 June 14-15. Times reporter Douglas Martin pens an obituary about Calit2-affiliated engineer and computer theorist Jack Wolf, who died last week. Citybeat advances the world-premiere of Jay Drose's "The Southern Question" at the Calit2 theater at UC San Diego. The Portuguese-language publication expands on a story originally published in The New York Times ("Digging Deeper, Seeing Further: Supercomputers Change Science") which featured several Calit2-affiliated researchers. A recap of the UCSD Chancellors Medal winners includes Richard Atkinson, a major donor to Calit2, which is headquartered at Atkinson Hall. Richard Atkinson, a major donor to Calit2, is featured in a recap of the UCSD Chancellors Medal winners. Nigeria's "most widely read newspaper" runs a story about supercomputing efforts at Calit2 that originally appeared in the New York Times. Calit2-affiliated researcher Benjamin Bratton presents a talk on the ethics of technology at Activate New York. The Riverside County-based Press-Enterprise picks up a story on Calit2 researcher Jurgen Schulze's work to visualize proteins in 3D. Nanowerk reports on research by Calit2 Project Scientist Jurgen Schulze to visualize proteins in 3D. The Turkish publication runs an excerpt of a New York Times article on Calit2's efforts to make supercomputers the next microscope. "International Science Grid This Week"
The online service applauds the New York Times for exploring the role of computing in science, but quibbles with the notion that the Times attributes to Calit2 director Larry Smarr, that visualization is the big bottleneck facing scientists today. The Portuguese-language "Biology Network" reproduces a New York Times story on Calit2's efforts to use supercomputing and visualization to re-shape scientific research in many fields. Writer Wendy Grossman mentions Calit2 Director Larry Smarr in a retrospective on the University of Illionis at Champaign-Urbana's seminal work in supercomputing. Xconomy writer Wade Roush interviews SRI International's Bill Mark, and mentions an upcoming event that will feature Calit2 Director Larry Smarr. The Tehran Times, Iran's leading international daily, picks up the New York Times story on Calit2's efforts to design scientific instruments for data visualization. Gizmodo blogger Sam Biddle comments on the New York Times' report on supercomputer research being led, in part, by research scientists at Calit2, including Director of Visualization Tom DeFanti. Computer scientists affiliated with Calit2 have come up with a way to use real-time occupancy sensors and computer algorithms to create ‘smart’ heating, ventilation and air-conditioning (HVAC) systems. The Korean news agency picks up a New York Times report on supercomputing technology developed, in part, at Calit2. The Russian publication runs a New York Times piece on supercomputing research being conducted, in part, by Calit2. The Power is in the I.D.E.A. Developer David Malmuth calls for Calit2, and its Center of Interdisciplinary Science for Art, Architecture and Archaeology, to be a part of a proposed Design School located in San Diego's new I.D.E.A. district. Larry Smarr, Tom DeFanti, KAUST, OptIPortables and of course Calit2 all feature prominently in John Markoff's overview of how computing and visualization are reshaping scientific research in many fields. NYT reporter John Markoff quotes Calit2 Director Larry Smarr in his report on the appointment of Joichi Ito as the new head of the Media Lab at M.I.T. A Pure Data project by Calit2-affiliated researchers Elle Mehrmand and Micha Cardenas is featured in a piece by Citybeat's Kinsee Morlan. An article on reducing energy consumption using real-time occupancy sensors and computer algorithms quotes researchers Yuvraj Agarwal and Rajesh Gupta, who are both affiliated with the UCSD division of Calit2. Innovations Report picks up an article about Calit2-led research to reduce the demand for energy use in buildings by using computer algorithms and real-time occupancy sensors. Xconomy San Francisco's Wade Roush reports on the "BeyondMobile" forum, which will feature Calit2 Director Larry Smarr as one of its speakers. Calit2-affiliated computer scientists at UC San Diego have come up with a way to use real-time occupancy sensors and computer algorithms to create smart heating, ventilation and air-conditioning (HVAC) systems. Calit-2 affiliated researchers are reducing energy consumption using real-time occupancy sensors and computer algorithms. In this video from the 2011 Burrill Digital Health Conference, Mindshare’s Fred Davis interviews Larry Smarr, founding director of Calit2. TMC.net, a clearinghouse for news related to communications and technology, reports on Calit2 Director of Visualization Tom DeFanti's recent tour of Australia and Singapore, where he touted the merits of the Calit2-developed OptIPortable displays. Reporter Sindya N. Bhanoo reports on Calit2 research scientist Albert Lin's quest to find the lost tomb of Genghis Khan using crowdsourcing and satellite imagery. TMC.net, "the world's largest communications And technology community," runs a story about Calit2's new Cyber-archaeology lab in Jordan, which will serve as as a year-round state-of-the-art research and training facility for UCSD graduate students and other foreign scholars, as well as Jordanian archaeologists interested in digital archaeology tools. Calit2 Director Larry Smarr is quoted in an article about Geoffrey Fox, who is a Distinguished Professor of Informatics, Computing, and Physics, and Director of the Digital Science Center, Pervasive Technology Institute. The local Greeneville, Miss., news channel reports on The Learning Worlds Institute's "The Art of Science Learning: Shaping the 21st-Century Workforce," a National Science Foundation-funded initiative that explores how the arts can be engaged to strengthen science education and spark creativity in the 21st-Century American workforce. A conference pertaining to the initiative will take place at Calit2-UCSD in June. TheStreet.com, a leading digital financial media company, picks up a story on The Learning Worlds Institute's "The Art of Science Learning: Shaping the 21st-Century Workforce," a National Science Foundation-funded initiative that explores how the arts can be engaged to strengthen science education and spark creativity in the 21st-Century American workforce. A conference pertaining to the initiative will take place at Calit2-UCSD in June. PhysOrg includes a photo of the Calit2 HIPerSpace display in a story about communicating the impacts of climate change to the public. HSNW picks up a Calit2 story on a collaboration between the High Performance Wireless Research and Education Network (HPWREN), Calit2 and the San Diego Supercomputing Center to build a scalable computer infrastructure to provide better access to camera feeds from rural areas when disaster hits part of San Diego county. Innovations Report -- a forum for science, industry and busiiness -- carries a story about a partnership between the High-Performance Wireless Research and Education Network (HPWREN), Calit2 and the San Diego Supercomputer Center to improve the cyberinfrastructure for wireless camera feeds from rural areas of San Diego county, which aid first responders in disaster scenarios. Canadian Internet guru Bill St. Arnaud praises Calit2 Director Larry Smarr's talk, “Three leadership opportunities for Washington State to Live in the Future,” as "compelling and succinct." An article from OHS directs users to the California Traffic Report app, developed by scientists at Calit2 at UCSD. Mentions research by Calit2's Jurgen Schulze and others to encode and display vector data that clearly shows magnitude and direction. This new visualization technique may help seismologists to accurately analyze ground movements for an earthquake, measure magnetic turbulence in deep space, or allow medical researchers to study areas, such as blood flow and nutrient absorption. Cinegrid, a project involving Calit2, is the winner of a prestigious award for Experimental/Developmental Applications in high-performance networking. An article from Cabling Networking Systems magazine reports on a CENIC award received by the international collaborative digital and rich media organization CineGrid, which involves Calit2. expansion of high-performance networking have been honored by CENIC as recipients of the 2011 Innovations in Networking Awards. Market Watch, a product of the Wall Street Journal Digital Network, reports on Cinegrid's CENIC award for Experimental/Developmental Applications in high-performance networking. Cinegrid involves Calit2. Digital Pro Sound reports on Cinegrid's CENIC award for Experimental/Developmental Applications in high-performance networking. Cinegrid involves Calit2. OptoIQ, the self-billed 'gateway to the application of light,' reports on the upcoming 50 Years of Science event on March 22, which will be held at Calit2. In its political column, the Mexican news service reports on a trip to southern California for members of the Federal Electoral Institute (IFE), to encourage Mexicans abroad to vote in future Mexican elections. The article notes that the IFE group also visited Calit2 following a meeting with faculty and students at IR/PS. In the March-April issue of the journal Archaeology, writer Nikhil Swaminathan reports on the use of cyber-archaeology tools such as infrared spectrometers and X-ray fluorescence analyzers. The article quotes Tom Levy, associate director of CISA3. Article mentions Calit2 chief scientist Ron Graham, who oversees a prize won by a mathematician who solved a 65-year-old math problem. Technology writer Brad Graves reports that recruiting star researchers such as Larry Smarr, director of Calit2, can attract funding to business clusters such as those in San Diego in biotech and wireless communications. The newspaper notes that Calit2's Maurizio Seracini will headline one of the symposia Feb. 22 as part of UCSD's ongoing celebration of its 50th anniversary. GravityEight: A New Online Hub for Wellbeing and the “Quantified Self"
ABC.net reporter Rod Tucker quotes Calit2 Director Larry Smarr in his comparative piece about broadband access in the United States and Australia. Union-Tribune reporter James Chute profiles Rand Steiger, the composer-in-residence at Calit2, who has received the received the Walter Hinrichsen Award from the American Academy of Arts and Letters. The Times of India reports on a study co-led by James Fowler, associate professor at UC San Diego in the Department of Political Science and Calit2's Center for Wireless and Population Health Systems. KPBS reporter Tom Fudge quotes Calit2 researchers Ingolf Krueger and Mohan Trivedi in his "On-Ramp" post about the U.S. government's investigation of Toyotas that inexplicably accelerated. RSC reports on a new technique developed by Calit2-affiliated researcher Joseph Wang that can print sensors onto the sleeves of wetsuits to alert the wearer to contaminated water or underwater explosives, such as mines. San Diego-based Commercial Satellite Audio/Video is the newest authorized eseller of the Hiperwall video wall system, which was developed at Calit2. Newswise distribution service picks up our story about Innovation Day Expo and Symposia (IDEaS) Feb. 22-25, which will feature Calit2-affiliated research scientist Maurizio Seracini. News syndicate News Blaze reports on UCSD's Innovation Day Expo and Symposia (IDEaS), which will feature CISA3 Director Maurizio Seracini. TMC.net, the world’s leading business to business and integrated marketing media company, picks up our story on work being done at Calit2 to improve 3D technologies for laproscopic surgeries and beyond. Scientists at the University of Michigan used cluster of 30 Intel Xeon processors provided by Calit2's National Science Foundation-funded OptIPuter project to analyze the DNA datasets. PhysOrg, a leading web-based science, research and technology news service, reports on research being conducted in Calit2's Video Processing Lab to enhance 3D capabilities and use them in laproscopic surgeries. Lifestyle reporter Will Bowen's feature on Calit2's 3-D immersive virtual reality StarCAVE calls StarCAVE creators Dan Sandin and Tom DeFanti "the new media art equivalent of the DNA-discovering Watson and Crick." The Imperial Valley News picks up our story on the 5th annual Cinegrid conference, held in December at Calit2. Japan's InfoSeek mentions Calit2 in an article about trends in cloud computing. VOSD Arts reporter Kelly Bennett features gallery@calit2 exhibit "Synthesis: Processing and Collaboration" in her round-up of local arts news. ImTech, a California-based nonprofit committed to supporting the development and adoption of immersive technology, posts a video featuring Calit2's Todd Margolis demonstrating the Heads-Up Virtual Reality System. Arts reporter Kinsee Morlan profiles Calit2 Director of Visualization and his long-time collaborator, Dan Sandin of the University of Illinois, Chicago. An exhibition of works by Sandin and DeFanti, "Synthesis: Processing and Collaboration," is currently on view at the gallery@calit2. An article about Calit2and InterDigital's technology contest which aims to discover new wireless research technologies. The Indian newspaper reports on a study out of Calit2's Center for Wireless and Population Health Systems that will evaluate the use of cell phone text messages to remind participants to make wise nutritional choices throughout the day. The Guardian's Neda Salamat reports on Calit2's 10th anniversary celebration, which took place Dec. 7, 2010. AnnaMaria Stephens, writing for Ranch & Coast, compiles a list of enrichment activities for children, including the Calit2 MyLab, which is headed by Saura Naderi. "National Center for Supercomputing Applications"
NCSA includes Calit2 Director Larry Smarr in a slideshow about its 25-year history. This independent blog about all forms of wireless communications mentions Calit2 Director Larry Smarr in a round-up on the latest in wireless news, including a bit about the Ocean Observatories Intiative, a partnership of Calit2. The Richmond, Va., cable channel advances the "Beyond Mobile" Xconomy forum on May 17, which will feature Calit2 Director Larry Smarr. An article by San Diego Union-Tribune reporter Nathan Max describes a pilot program that will offer classes to schoolchildren at the South Metro Career Center. The project is a partnership of the San Diego Workforce Partnership and the UCSD Center for Community Well-Being, which is affiliated with Calit2. Three researchers at the Calit2-affiliated Center for Networked Systems recently broke two of their own world records for data sorting. Scientific Computing, which covers information technology for science, picks up our story on Calit2's Tom DeFanti and his proof-of-concept excursion to capture 3D images of Luxor. Digital Photography runs our piece on Calit2 research scientist Tom DeFanti's mission to capture 3D CAVEcam footage of the temples at Luxor. The Vol. 14, issue 16 newsletter Cenic Today mentions Calit2 Director of Visualization Tom DeFanti's quest to capture 3D imagery of Luxor, Egypt, as well the Calit2-affiliated Cyberinfrastructure for Comparative Effectiveness Research (CYCORE). "Calit2 Uses 3D CAVEcam to Capture 3D Surround Images of the Temples at Luxor"
Writing for the La Jolla Light, Calit2's Chris Palmer describes a Calit2 outreach program that taught girls ages 7 to 16 how to build animatronic hats for the Opening Day of the Del Mar horse races. The Texas news station reports on a new forum being hosted by UC San Diego and The Atlantic Magazine. "The Atlantic Meets the Pacific" conference takes place Oct. 17-19 at premier venues at UCSD, including Calit2's headquarters at Atkinson Hall. Voice of San Diego reporter Kelly Bennett says she "can't stop exclaiming" about Calit2 researcher Maurizio Seracini's high-tech quest to find a lost painting by Leonardo da Vinci. San Diego Metro advances "The Atlantic Meets the Pacific" forum, which will take place in October at various premiere UCSD venues, including Calit2. San Diego Union-Tribune columnists Neil Senturia and Barbara Bry challenge readers to attend "The Atlantic Meets the Pacific" forum (to be held in part at Calit2). Columnists Neil Senturia and Barbara Bry report on Calit2 Director Larry Smarr's 10-year quest to study the inner workings of his own body using digital tools. WhyITNow, which is supported by a consortia of IT industry professionals, publishers, educators, government agencies and groups, reports on a new $175K contest sponsored by InterDigital and Calit2 to develop innovations in wireless technology. An article about InterDigital's collaboration with Calit2 on a wireless research contest. The Star Times reprints an article that originally appeared in the New York Times and featured predictions about the future of computing from Calit2 Director Larry Smarr and other visionaries. This online magazine for programmers includes a round-up of essays on the future of computing that recently appeared in the New York Times, including one by Calit2 Director Larry Smarr. A press release from Reuters about the Grace Hopper Women in Computing career fair, for which Calit2 was a major sponsor. The fair gave technical women opportunities to be exposed to nearly 100 companies. Steve Lohr of International Herald Tribune talks about the future of internet technologies, and how they might be applied in a more physical way in upcoming years. "The Union Tribune San Diego"
An article profiling notable composers from UCSD, including Calit2 composer-in-residence Roger Reynolds and his piece, entitled "Sanctuary."